Good Dream Hotel, Koh Tao, Tajlandia : Rezerwuj teraz! 1.Basic private room with fan. 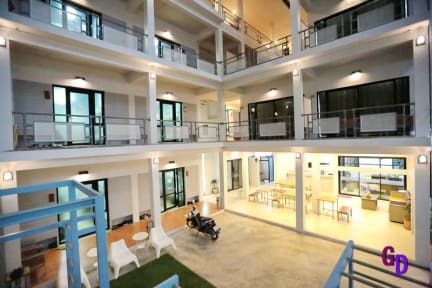 It is a kind of very basic and lowest accommodation type in our property,located on the ground floor of first building. En-suite with Fan,TV, cable satellite,digital safety box and hot shower. 2.Standard private room with Air conditioned. Located on first floor of first building. En-suite with Air conditioned,TV, cable satellite,digital safety box and hot shower. 3. Standard 8 beds mixed dorm. Our spacious dorm rooms are quite big with a wide space between very solid bunk beds( Don’t be worried the beds to be shaking!!!!). En-suite with Air conditioned, Fan, Digital Safety box, reading light and power plugs for each person .2 toilets and 2 showers in hot/cold are provided for each dorm room.Newly renovated at Nov 02,2015. These room types are adjacent and located on second building. 4. Deluxe 8 beds mixed dorm. Filled with modernized amenities and attached with very hygienic bathroom. En-suite with Air conditioned, ceiling fan, hair dryer, digital safety box ,hot shower, reading light, power plug and mini desk for each person. Our newly added this room type are Quite luxury and comfortable and designated for those who liked to chill out very comfortably. 5. Deluxe 6 beds mixed dorm. 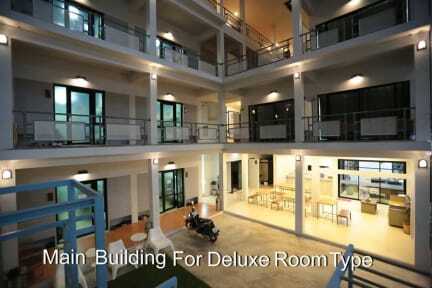 Located on 2nd and 3rd floor and completely similar with the above dorm type plus sofa and fridge. 6. Deluxe Double room with balcony. With own balcony, designated in luxury condition with modernized amenities and located on 2, 3 and 4th floors. En-suite with Air conditioned, ceiling fan, fridge, Sofa, desk, hair dryer, digital safety box, electric kettle, complimentary bottled water and hot shower. Quite luxury and comfortable!!! 7.Deluxe Triple Room.One double bed and one single bed, designated in luxury condition with modernized amenities and located on 2, 3 and 4th floors. En-suite with Air conditioned, ceiling fan, fridge, Sofa, desk, hair dryer, digital safety box, electric kettle, complimentary bottled water and hot shower.